Built in the Maldives, we stayed on a stunning luxury yacht and really was is in a class of its own. 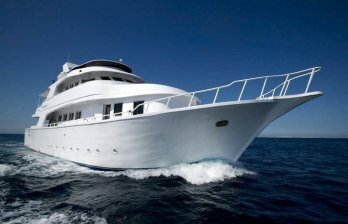 This unique 33.5m wooden vessel boasted nine modern, spacious cabins and could accommodate up to 18 guests. The luxurious cabins featured two ocean view suites offering exquisite views of the beautiful Indian Ocean and a fabulous en-suite. In addition, there were seven other inter-changeable superior twin or superior double cabins. All cabins were air-conditioned with modern and comfortable interiors and fittings, en-suite bathrooms, mini bar, safe and full HD TVs. There was even a jacuzzi on-board which we made full use of! We did the ‘Project Shark’ trip which is developed to highlight the global issues facing sharks, with a Maldivian focus, as well as enjoying some of the most exciting dive sites the Maldives have to offer. 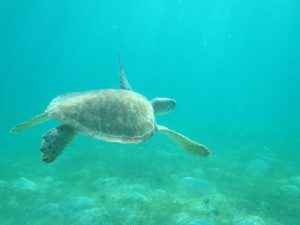 The week involved close encounters with sharks, manta rays and whale sharks (although the sightings could not be guaranteed – we saw everything!) and we observed them in their natural habitat and donated vital information to local Maldivian marine research organisations. Project Shark: Maldives was delivered by a resident marine biologist, who conducted seminars giving divers the opportunity to gain a better understanding of the biology and behaviour of sharks. There was also a chance to learn about globally endangered marine species and what we as divers we can do to aid their protection. During this trip, we were able to play a part in adding to valuable research efforts by the ‘Manta Trust’ who work towards the conservation of manta rays worldwide. Throughout the week, we recorded our sightings for identification and submitted them to existing Maldivian marine life charities, including The Manta Trust. Since the eastern side of the channel is open ocean, large predatory fish can regularly be spotted here. This site is famous for sightings of sharks, schools of eagle rays and the occasional sail fish and hammerheads. The best condition to do the dive is when the current is flowing into the atoll. The dive begins on the outer reef following the current into the atoll. Most of the pelagic species can be observed on the eastern side, where the reef drops off into the deep ocean. At the end of the dive in the channel, along the reef we found overhangs with plenty of soft coral growth and small fish. Madi means “ray” in Dhivehi. Between the months of December and April this is a superb manta ray cleaning station. 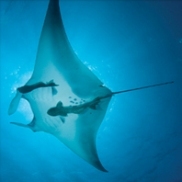 As with many good manta points, the reef slopes down gently from its top at 8m (25ft) to the atoll floor at 30m (100ft). Although there are many cleaning stations along this 1km reef, the area where the mantas are most active is midway along the northern side. A deep basin, almost 100m (110yd) across has formed in the coral and as the currents flow out of the atoll, the waters eddy in the basin. 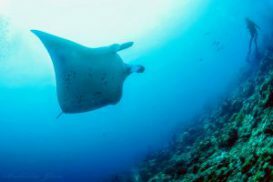 This attracts the mantas, which hover gracefully in the current – and we saw plenty of these magnificent animals! The north east is peppered with submerged pinnacles covered predominantly in soft corals, whilst the west will see you surrounded by jacks and snappers. We kept an eye open for sharks and rays at 30m – and we were not disappointed! It is highly recommended that you have proper dive insurance and not just insurance cover from a bank as this may not be adequate for the dive trips. If you require Dive Insurance then try Aqua Med. It is highly recommended that you have proper dive insurance and not just insurance cover from a bank as this may not be adequate for the dive trips. If you require Dive Insurance then try DAN Europe.